The Bellini is a popular sparkling wine cocktail and a perfect way to make your favorite wine a little peachy. The recipe is very easy and the drink is a lot of fun to share. The story behind the Bellini is that is was created in the 1930s or 40s at Harry's Bar in Venice, Italy by bartender Giuseppe Cipriani. It was named after the Italian renaissance painter, Giovanni Bellini. Originally, the Bellini used sparkling Italian wine, particularly Prosecco, and it is still made that way in Italy. Elsewhere, it is often made with Champagne, though almost any sparkling wine will do. The Bellini is a popular drink for brunch and if you want something a little more innocent, try the Baby Bellini. Pour the peach juice into a Champagne flute. Slowly top with sparkling wine. 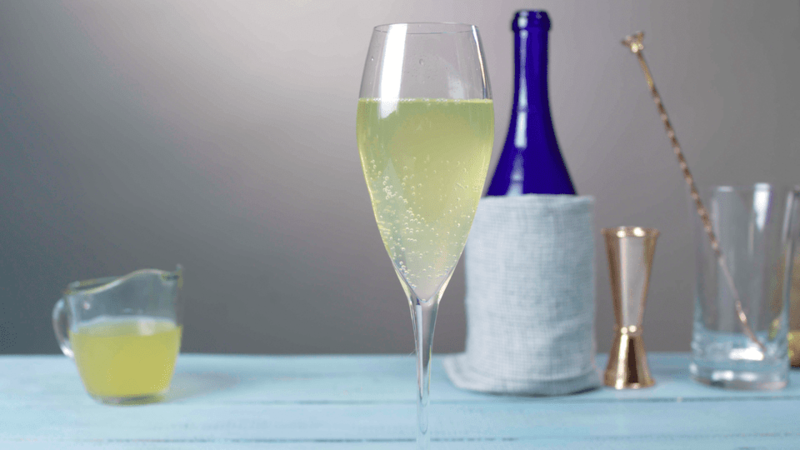 You will often find that Prosecco costs less than Champagne, so you can be true to the original Bellini while saving a few bucks. When it comes to the peach ingredient, you have a few options. Peach juice would be the first choice, though if you cannot find that, we would recommend a peach nectar. The nectar is available at many grocers and can often be found in the juice aisle. Use fresh peaches when possible. During peach season, there is no reason to buy a packaged peach product and you can enjoy the freshest Bellinis during those few months of summer (June through August is best). For an interesting twist, choose a selection of peach varieties and combine them into a juice or puree. Don't forget to save a few slices for a garnish. Either cut a slit in each slice and rest them on the rim of each glass or drop a slice inside the flute and pour the drink on top. If you opt for the second option, quickly dunk each slice in lemon juice to prevent it from browning and toss them into the freezer for an hour or two. To keep the fruit from freezing together, place them in a single layer on a plate or another flat surface. When it's Bellini time, you'll have frozen fruit to keep your drinks cold with no dilution. Fresh peach juice is easy. If you have an electric juicer, simply slice and pit your peaches and process them into juice. Be sure to remove the pit first, though you can leave the skin as it is edible. It's also a good idea to strain the juice to make sure your drink is free of chunks. Got a blender? Make a peach puree. It is also very easy to make a fresh peach puree at home and all you really need is a blender or food processor. Again, wash, pit, and slice your peaches, then blend them up until smooth. If you like, add a teaspoon each of sugar and lemon juice to enhance the flavor. Be sure to strain your puree to remove any large bits of fruit. In general, your homemade peach puree or juice should be good in the refrigerator for up to one week in a well-sealed container, particularly if you add ​a dash of lemon juice to act as a preservative. Peach schnapps? You can absolutely skip all of the other peach ingredients and simply pour a shot of peach schnapps into your glass. It will make your Bellinis a little stronger than intended, but it's still mild and you will definitely have no problem finding schnapps. How Strong Is the Bellini? The Bellini is such a great brunch drink because it is light on the alcohol. It is really no stronger than the average glass of sparkling wine, even a little less because of the peach juice. On average, with an 11 percent ABV Prosecco, the Bellini weighs in at 7 percent ABV (14 proof). Now, if you opt for the schnapps (average 24 percent ABV), you're looking at about 15 percent ABV (30 proof). That's still at very mild in comparison to other cocktails.